Oculus is talking about its latest Oculus Rift prototype, and thanks to a number of improvements users will reportedly no longer experience any motion sickness or nausea. That's what the company and some high profile testers are saying, though the press won't get the chance to check it out until CES 2014 next month. Oculus announced on December 12 that it had received $75 million (about £46m, AU$83m) in funding from the investment firm of web browser co-inventor Marc Andreessen, who also joined the company's board of directors with his colleague Chris Dixon. According to The Verge, it was the latest and most advanced version of the Oculus Rift that convinced them to join the VR party. In the new Oculus Rift headset, the resolution is higher, the latency is lower and the motion blur is gone. The company said those factors were causing some users to walk away feeling ill, a problem that has supposedly been eliminated. The latest version of the Oculus Rift also has full positional motion tracking for the first time, so it knows where your head is in 3D space in addition to where you're looking. That means it can detect when you lean forward and backward and make other motions with your head, bringing your virtual movement that much closer to your real-life actions. 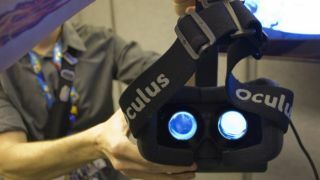 It's not just Oculus attesting to all this - the company showed it to big names in games like Epic Games co-founder Mark Rein, Interplay founder Brian Fargo and Cliff "Cliffy B" Bleszinski, who all tweeted their praise. Oculus also clarified its relationship with Valve; rumor in November was that Valve was developing its own Oculus Rift competitor, but it turns out the two companies are collaborating on R&D thanks to Oculus CTO and Doom creator John Carmack and Valve's Michael Abrash having worked together on the game Quake in the 1990s. That doesn't mean Valve still won't release its own version, but at least we know it will be a friendly competition if they do. With every barrier - from funding to the plaguing motion sickness now (hopefully) a thing of the past - Oculus has high hopes for the future. Oculus Rift creator Palmer Luckey shared some of those hopes, and they include uses ranging from live concert viewing to immersive field trips where students are engaged despite never leaving the classroom. He also revealed that Carmack is working on porting the Rift dev kit to Android so that the virtual reality headset isn't dependent on computers, but can stream experiences from phones and tablets as well, something which Carmack has previously has previously teased. Luckey even hinted that the Oculus Rift might some day have an Android brain of its own, without needing to be tethered to another device, though that sounds a long way off. Oculus hopes to get the Oculus Rift onto shelves and into stockings by the holidays in 2014. Look out for more on the new Oculus Rift as CES approaches. TechRadar went hands-on with the Oculus Rift - here's what we thought.